You may have seen the terms “biophilia” or “biophilic design” brandished around the internet lately, posted between beautiful images of sprawling interior design and architecture filled with plants and nature-inspired sculpture installations. Biophilia isn't new–but it is a growing discipline in interior design. If you are interested in healthy living or are a building owner, it’s a subject worth learning about. Biophilic design puts a few simple principles to use to create spaces that are both visually beautiful and spiritually healthful. As more and more of us make our careers our focus, calmness, serenity and healthy living can be difficult to achieve without the help of nature and smart design. There are years of study to support what we already know in our bones: spaces that have nature incorporated are more appealing to us, and they have marked health benefits. Terrapin Bright Green is a consulting firm specializing in sustainability in order to create a healthy, prosperous, and regenerative future for all. They produce workshops, research, planning, guidelines, and product development. They have researched biophilia and organized their findings into 14 principles of biophilic design and have studied the effects of biophilia on our health and wellness. For the most part many of the principles are simple and intuitive, such as ‘Visual Connection with Nature’, which is just what it sounds like: adding natural elements or a view to nature into your space. However if you’d like to read an in-depth, thorough explanation of all 14 principles, you can see the results of Terrapin’s research here: https://www.terrapinbrightgreen.com/reports/14-patterns/ . For today, we need only to talk about the three subcategories of the design principles: Nature in the Space, Natural Analogies, and Nature of the Space. Nature in the space refers to the presence of natural elements in an interior. For example, that could mean having plants, shells, or water features. But it could also mean more abstract features, like natural light or light that changes throughout the day, air circulation, and a view to the outdoors. “What you exclude is as just important as what you include,” said Barnard. “I choose art made with natural materials or vintage art that has off-gassed to avoid putting noxious smells or chemicals into a space. Indoor air quality accounts for part of how we feel about our homes and how comfortable we are.” All of her designs include live plants, too, which contributes to air quality, a non-visual connection with nature. Terrapin also explains that there are three basic types of “nature-health” relationships: cognitive functionality and performance, psychological health and well-being, and physiological health and well-being. Cognitive functionality and performance is our mental acuity and focus. Psychological health and well-being refers to our mood, perception, and emotional state. Physiological health and well-being is our bodily health and performance. All three areas of well-being see improvement when the 14 principles of biophilic design are applied in a space. The benefits have been thoroughly studied: each principle has been individually tested and shown improvements such as concentration, stress hormone levels, overall happiness, and numerous other positive effects. In fact, research by other sources has yielded similar results. The Human Spaces Global Report also found greater levels of well being in subjects with a view of natural elements rather than urban settings, according to a recent article by Steelcase’s magazine 360. Sensory richness: mixing colors, textures, sizes and shapes. Varied elements in a space mimics nature and puts us at ease. Natural rhythms and signals: anything that reminds us of natural processes can help restore us. Natural lighting that allows real sunlight, or artificial light that changes to mimic natural light. Challenges in nature: the idea is that our challenging environment is what pushed humanity to grow into what we are today, so there should be encouragement towards effort. Local distinctiveness: having a feature that does not repeat anywhere else in the building can help large offices from becoming soulless or bleak. Reserving a certain material or color for one room can make it and the surrounding space more special and pleasant. These four principles are a useful way to understand how we are affected by nature, and offer another way to begin tackling the design challenges you may be facing in your home or workspace. Whether you use these four facets or the 14 principles of biophilic design as a jumping off point to improve your space, a deeper connection with nature is healthy and beneficial. “When you strip it down to basics, using biophilic design means including pieces of nature in the design, elements inspired by nature, and mimicking natural environments with layout, architecture and planning,” Barnard said. Homeowners and building owners especially might consider taking these premises into account in order to make their home or office a place that promotes their mental and physical wellbeing. Getting started can be as simple as purchasing a few plants. If you aren’t sure where to go from there, a designer can help you put all the principles into practice. Ideally, your space incorporates nature, smart design and healthy living. 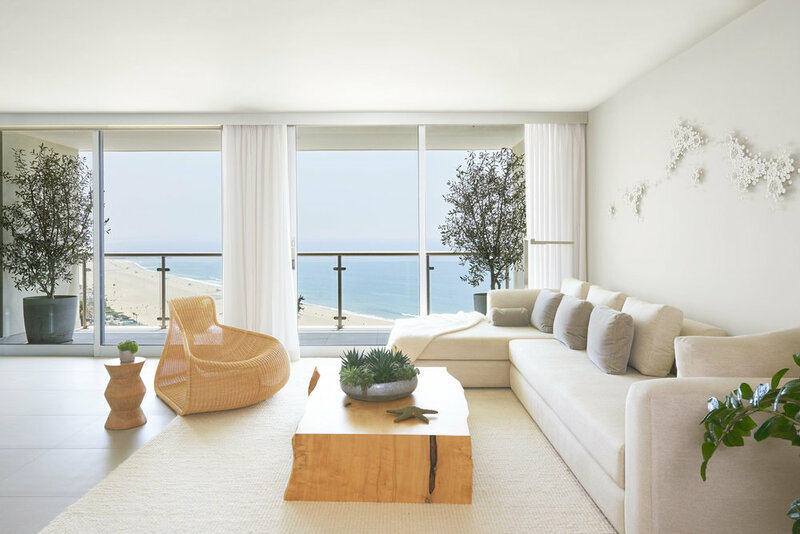 Undertaking a broad range of projects, all of which are grounded in smart design and mindful of healthy living, Sarah Barnard’s diverse body of work includes upscale private residences, chic restaurants, luxurious spas and impressive corporate headquarters. Her projects have been featured in local and national publications, and have placed prominently in several noted design competitions. Sarah holds a Master of Fine Arts degree from Claremont Graduate University as well as undergraduate degrees in Art and Interior Architectural Design. Her interior design practice is the culmination of education and interests in art, architecture, textiles and the environment and she has written several articles for important publications including the USGBC, United States Green Building Council. Barnard is a member of the American Society of Interior Designers (ASID), is certified by the National Kitchen and Bath Association (NKBA), and is recognized by the International WELL Building Institute as a WELL Accredited Professional (WELL AP), the International Institute for Bau-Biologie & Ecology as a Building Biology Practitioner (BBP) and by the United States Green Building Council as a Leadership in Energy and Environmental Design Accredited Professional (LEED AP). She has served on the Santa Monica Conservancy's board of directors and specializes in sustainable interior design, health and wellness and historic preservation. Sign up to receive our newsletter featuring new projects, design trends, tips and recent design publications.